These cookies are from Clotilde of Chocolate and Zucchini via a post by David Lebovitz. I’m always drawn to chocolate recipes and the more chocolate-y the better. This certainly did not disappoint and I particularly like the salt sprinkled on top. I did need to flatten them out a bit before because because they didn’t seem to spread as well as I thought they should have. I didn’t bother with two kinds of flour, I just stuck with the all-purpose flour. And the cacao nibs are a a definite must in this recipe. I used the chocolate extract in addition to the vanilla. These were a big hit and I would definitely make them again. Preheat the oven to 350F (180C) and line a baking sheet with parchment paper or silicone baking mat. 1. In a small bowl sift (sifting is optional for me) the flour, cocoa powder and baking soda together. 2. In a clean, dry bowl set over a pan of simmering water (or in a microwave), melt half of the chocolate (2½ oz, 70g), then let cool to room temperature. Mix the other half of the chocolate chunks a bowl with the cocoa nibs. 3. Beat the butter with a standing electric mixer, or by hand, just until smooth. Beat in the sugar, salt and vanilla or chocolate extract. 4. By hand, stir in the melted chocolate, then the flour-cocoa mixture. Then finally the chocolate chunks and nibs. 5. Scoop the dough into rounded teaspoons and place evenly-spaced on the prepared baking sheet. Lightly flatten the cookies. Sprinkle with fleur de sel, if desired. 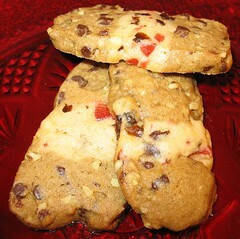 Bake for 10-12 minutes or until the cookies take on a slightly dry sheen to the top. They may feel soft, but don’t worry; they’re firm up just fine when cool. I made the Lady Baltimore Cake from the Cook’s Illustrated Holiday Baking Issue. I remember reading about this cake as a kid in the Betsy-Tacy books and this is the first time I found a recipe and had a chance I had to make one. According to Cook’s Illustrated, it was popularized by the publication of Owen Wister’s Lady Baltimore , a romance novel from 1906 that inspired people to start making the cake. I’ve always found the fiction can influence what I want to bake. I forgot to take a picture of the inside of the cake, but it was pretty with all the layers and the dried fruit added a lot of color. This started falling apart a bit when I started cutting it, perhaps I did not build this as well as I could have. I really enjoyed this cake. The frosting was exactly as I remembered for a seven minute frosting, it reminds me of marshmallows. I should have made a companion recipe to use all the leftover egg yolks, next time I’ll make some ice cream to go along with it. I didn’t quite use all the sugared pecans, but they were good on their own. This was a tall cake and my cake stand cover was too short and I had to improvise a covering. If you’ve ever forgotten to bring the milk and egg white mixture to room temperature, set the bottom of the measuring cup containing it in a bowl of hot water and stir until the mixture feels cool rather than cold, around 65 degrees. The cake may be prepared up to 3 days ahead of time and wrapped tightly in plastic wrap. When preparing the icing, you can speed up the cooling process by transferring the hot egg white mixture to a stand mixer and beating on medium-high speed until thick and stiff, about 5 minutes. 1. For the Cake: Adjust oven rack to the middle position and heat oven to 350 degrees. Spray three 8-inch round cake pans with nonstick cooking spray, dust with flour, and tap pans to remove excess flour. Mix milk, egg whites, and vanilla together in 2-cup measuring cup. 2. Mix flour, sugar, baking powder, and salt together in bowl of stand mixer fitted with flat beater at low speed. Add butter and beat at low speed until mixture resembles moist crumbs, with no powdery streaks remaining. 3. Add all but 1/2 cup of milk mixture to crumbs and beat at medium speed for 1 1/2 minutes. Add remaining 1/2 cup of milk mixture and beat 30 seconds more. Stop mixer and, using rubber spatula, scrape sides of bowl. Return mixer to medium speed and beat 20 seconds longer. 4. Divide batter evenly among 3 prepared cake pans and, using rubber spatula, spread into even layer. Arrange pans at least 3 inches from oven walls and 3 inches apart. (If oven is small, place pans on upper-middle and lower-middle racks in staggered fashion to allow for air circulation.) Bake until thin skewer or toothpick inserted in the center comes out clean, 21 to 25 minutes. 5. Rest cakes in pans 3 minutes, then loosen from sides of pans with paring knife. Invert cakes onto large plate, then reinvert onto wire racks. Cool cakes completely, about 1 1/2 hours. 6. For the Icing: Bring 1 inch water to simmer in medium saucepan over medium heat. Whisk sugar, egg whites, water, cream of tartar and salt together in medium bowl large enough to rest on sides of saucepan, but not deep enough to touch simmering water inside. Place bowl over barely simmering water and, using hand-held mixer, beat egg white mixture on medium-high speed until stiff peaks form, 6 to 8 minutes. 7. Remove bowl from the saucepan, add vanilla, and continue to beat until mixture is cooled to room temperature and icing is very thick and stiff, about 8 to 10 minutes, set aside. 8. For the Filling: Process dried fruits and pecans in food processor until finely chopped, about 20 seconds. (Alternatively, fruits and nuts can be chopped very fine with knife.) Transfer mixture to medium bowl and mix with rum. Stir 2 cups icing into fruit and nut mixture. 9. To assemble the cake: Place 1 cake round on serving platter. Spread half of fruit and icing mixture over cake. Repeat with another cake round and remaining fruit and icing mixture. Top with remaining cake round. Spread remaining plain icing over top and sides of cake, using back of spoon to create attractive swirls and peaks. Decorate with sugared pecans. Depending on how many pecans you use to decorate the cake, you may have some left over. Nuts can be kept in an airtight container at room temperature up to 5 days. Choose pecan halves that are not broken. 1. Adjust oven rack to middle position and heat oven to 350 degrees. Spread pecans in even layer on rimmed baking sheet and bake, tossing nuts occasionally, until fragrant and deepened in color, 6 to 8 minutes. 2 While nuts are toasting, stir sugar and salt together in medium bowl. 3. Bring rum, vanilla, brown sugar, and butter to boil in medium saucepan over medium-high heat, whisking constantly. Stir in toasted pecans and cook, stirring constantly, until nuts are shiny and almost all liquid has evaporated, about 1 1/2 minutes. 4. Toss pecans in bowl with sugar and salt mixture and return to baking sheet to cool completely, about 15 minutes. I have no idea where this recipe originally came from but it has been something in my family for many years. 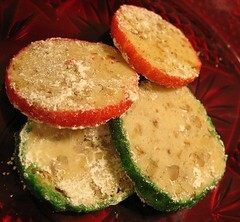 They are tasty and also festive with the green and red sugars. They could easily be adapted for other times of the year by changing the color combinations. They go together very quickly and can be stored in the freezer for several months. Pecans are my favorite (baking) nuts is pecan and I have a bias to using them and tend to favor recipes that include pecans. Cream butter and sugar. Add water and vanilla, mix. Stir in flour. Add nuts and mix well. Shape into logs (D ~ 1 1/2″) and roll in colored sugar. Freeze. To Bake: Preheat oven to 325. Slice into approximately 1/4 inch discs. Bake for 8-10 minutes. Roll in confectioners sugar while still warm. This recipe originally came from the Ladies Home Journal some time in the early 1950s and was passed down in my family as a Christmas cookie that was made almost every year. I like it because of all the stuff in it. The biggest problem for me is finding the candied cherries at the store. I sent this off as my recipe for Operation Baking GALS for December, I hope they survive the trip. Prepare each dough separately. Cream butter, sugar and eggs. Mix dry ingredients. Mix dry and wet. Add walnuts and chips to dark dough and raisins and cherries to light dough. Line bottom and sides of a loaf pan with wax paper. Put in 1/2 dark dough, all of light, 1/2 dark. Cover with wax paper. Chill in freezer. Remove from pan. Cut into four strips. Slice each strip for cookies. Strips may be frozen for later baking. Bake at 350 deg. for 10-15 minutes until lightly brown. I received the book Cupcakes: Luscious bakeshop favorites from your home kitchen by Shelly Kaldunski and was very excited to make a recipe from this. I like that most recipes made only 12 cupcakes. I tried the chocolate cupcakes with vanilla buttercream. The chocolate cupcake was good. It reminds me of cake-y brownies and had the slight hard crust on the top. It was not overly chocolate-y. I might add some chocolate extract next time to heighten the chocolate flavor. The amounts were slightly inconvenient (i.e. the recipe specified 3/4 plus 2 tbsp) and I would personally have preferred everything by weights. This was very easy to mix together. The vanilla buttercream went together fairly easily, I used my KitchenAid bowl on the stove and hand mixed while it was on the stove and let my stand mixer do the heavy whipping. I piped the frosting, which was a little loose and practically dripped out of the pastry bag, perhaps I needed to beat it a little longer. This was a nice, light buttercream and not too sweet. I added some chocolate sprinkles for decoration. I am looking forward to trying some of the other recipes in this cookbook. In a bowl, whisk together the flour, cocoa powder, baking powder and salt. Place the chocolate and butter in a large heatproof bowl and set over but not touching simmering water in a saucepan; stir frequently until melted and smooth, about 5 minutes. Remove the bowl from the saucepan and let the chocolate mixture cool to room temperature, 10 to 15 minutes. Using a wooden spoon, stir the sugar into the chocolate mixture until combined. Stir in the eggs one at a time, beating until combined after each addition, then beat in the vanilla. Gently fold in the flour mixture just until no traces of flour remain; do not overmix. Divide the batter evenly among the prepared muffin cups, filling each about three-fourths full. Bake until a toothpick inserted into the center of a cupcake comes out with only a few moist crumbs attached, 22 to 24 minutes. Transfer the pan to a wire rack and let cool for 5 minutes. Then transfer the cupcakes to the rack and let cool completely, about 1 hour. This recipe is from an unknown origin but my parents have been making it since I was a kid. In our family the name is “Pecan Tossles” which is likely a corruption from the word Tassies, which means miniature or small tarts or pies. 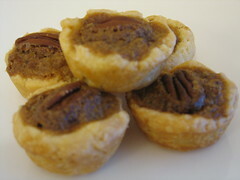 I typically describe it to other people as Mini Pecan Pies since that is easier to understand. I consider this one of my signature dishes and then make this every year. The filling is not a typical pecan filling with the corn syrup but instead has brown sugar. I think I prefer this to regular pecan pie. The filling makes enough for 48 cookies but each recipe of crust makes 24 and needs to be doubled to make the full amount. I personally find the filling delicious to eat on its own but it is essentially pure sugar. Soften cream cheese and butter to room temperature, mix together. Add flour and cut into the fat or use stand mixer. Shape into a ball. Chill ½ hr. Cut ball in ½, ½, ½, 1/3 to make 24 pieces. Roll into small balls, one for each mini muffin. Press and shape into tins. Make this twice for the amount of filling. Beat eggs, add sugar, salt, butter, vanilla. Mix together until smooth. To each shell, add a small sprinkling of pecans. Pour filling in each, add a pecan on top. Bake at 350° for 25 min, crust should be slightly brown. Note: The filling is enough for about 2 times the crust or approximately 48 mini pies. I have been using the Beater Blade for the past several recipes and I now feel I can write an honest review about it. It is extremely weight-light since it is made entirely of plastic (polycarbonate) and I was concerned it would not have the force necessary to mix everything well. I like it and it does do a reasonable job of wiping down the sides of the bowl, but I still need to go through with a spatula for some of the “sticker” recipes. I feel like it leaves more residue than the SideSwipe every did. The Beater Blade did not strain the motor. The SideSwipe seemed to cause some motor strain and a very small rocking of the mixing. Overall I preferred the SwideSwipe, up until the point where it broke. I can be perfectly happy with the Beater Blade, however, if it also breaks in short amount of time, I think I’d be more likely to replace it with the SideSwipe. I have also noticed that a few major retailers have started carrying the Beater Blade (just within the last week or two) and I suspect it will be more widely available in the future.